Today is special to me. So special that it was difficult to settle on a feature for this week's Living Large In Small Spaces. There are so many small homes and cottages, bungalows and studios waiting to be discovered and drooled over, but I think Lavender Cottage was meant to be shared today. It's just that charming. Notice that number above? Can you believe I've written 99 LLISS posts -- now 100 -- to inspire my readers on how to live large in small spaces? Me either, but it's true. And that's why today is so important to me. How do I celebrate 100 posts (not to mention the hours of cyber searching and typing) with all of you -- my best friends? 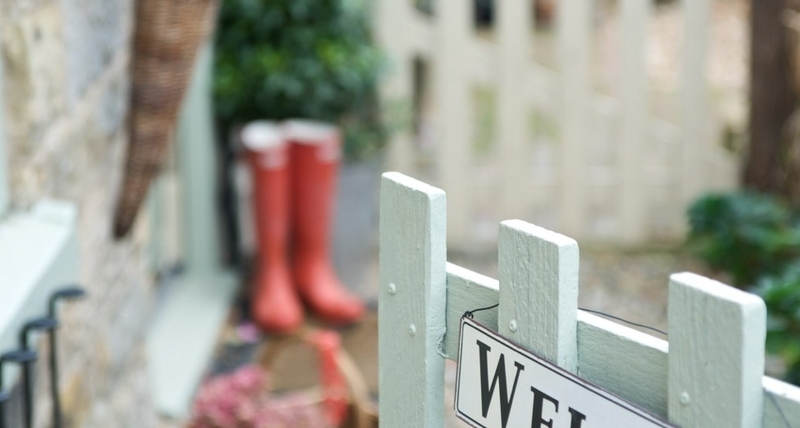 It starts with finding and sharing an endearing cottage and garden. 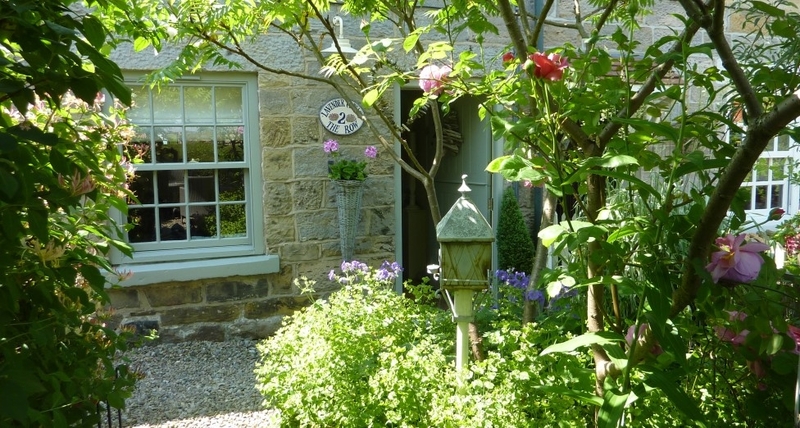 Located in a tiny hamlet in Yorkshire, Lavender Cottage is the holiday home of artist and designer Helen Charlton and her husband John. I'm embarrassed to admit it, but in the email I sent to Helen thanking her for allowing me the privilege of sharing her cottage I actually gushed a bit. You see, Lavender Cottage is pretty close to my dream cottage. A lovely English country cottage with the sort of architectural details that inspired the design of our own cottage. When the Charltons bought the 18th century stone cottage they waited eight months before making any changes. During that time Helen kept a design journal crammed with inspiration and ideas until the contractor, who had worked on their farmhouse renovation (their primary residence), was available. He actually lived in the cottage for five weeks while he completed the remodel. Dark ceiling beams were stripped and painted. Local sandstone was used for the new chimney breast, and an aga wood-burning stove was installed to keep the cottage cozy on winter nights. 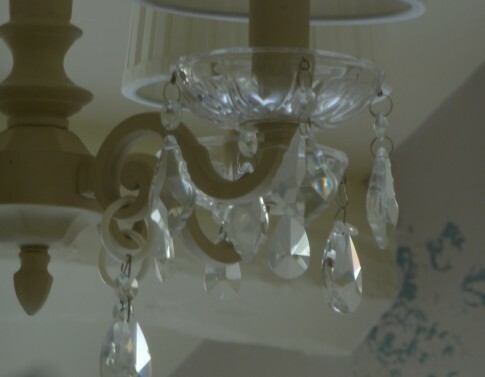 Helen's choice of a pink chandelier is a pleasant surprise. I love the painted grandfather clock and the window seat. The beautiful hardwood floors are solid maple. 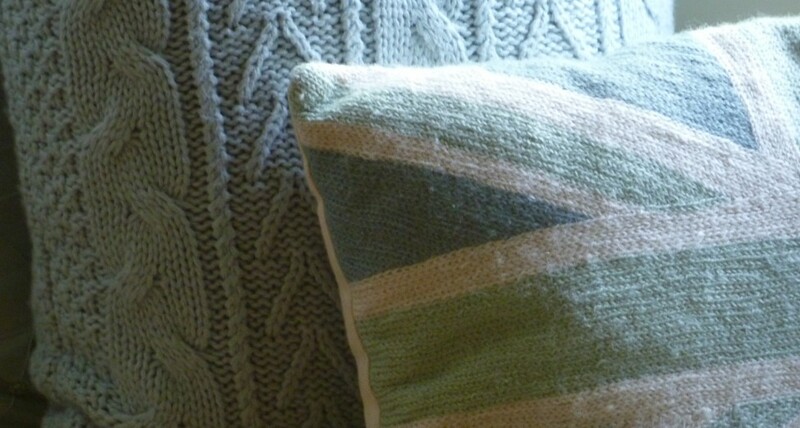 A color palette of sea-side blue greens, sandy creams and pebble greys was used throughout the cottage. 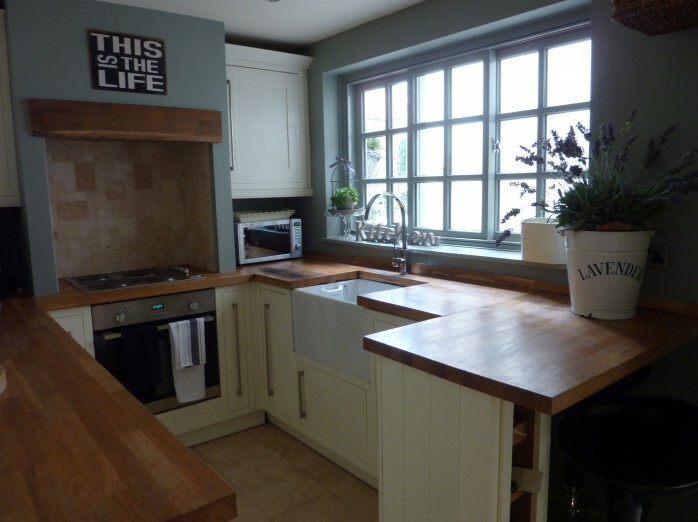 The contemporary kitchen is beautifully appointed with oak countertops, travertine flooring and a Belfast sink. A bank of windows is the icing on the cake. 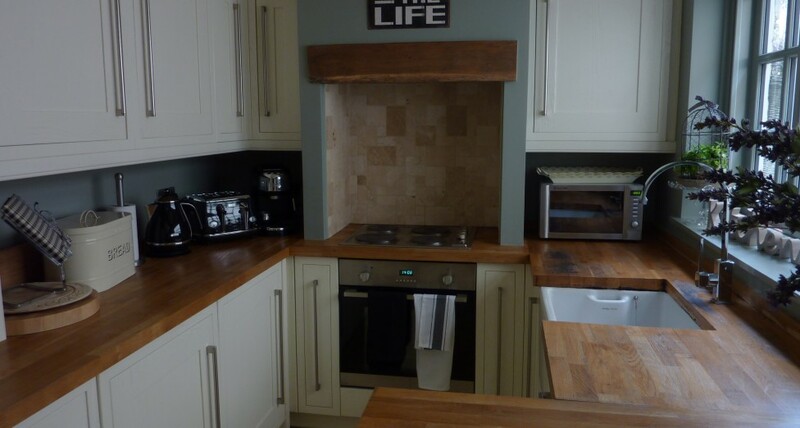 A bar was installed to provide dining in the small kitchen. Careful attention was given to every detail in the cottage. 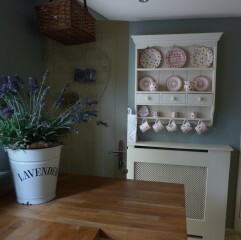 A delightful wall cupboard holds Emma Bridgewater pottery. 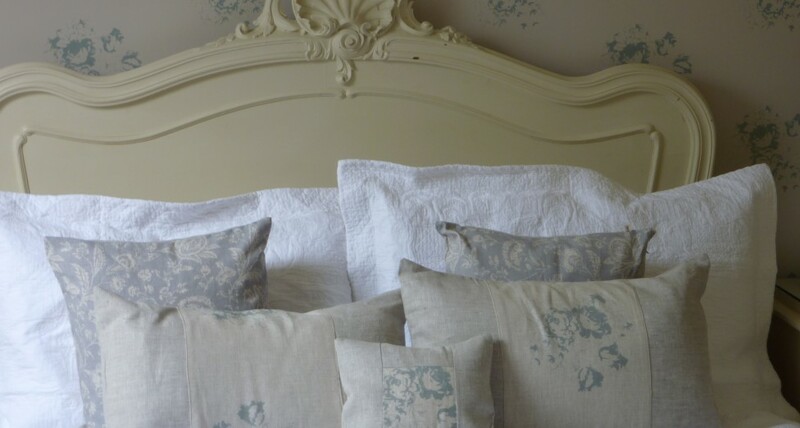 The antique French bed is simply gorgeous. Really, this bedroom is perfection. A pretty chandelier hangs over the bed. In the bathroom the addition of a tube skylight brings in natural light. By the way, have you noticed how many homeowners are installing the tub fixtures on the side wall rather than at the head of the tub these days? Brilliant, right? Who wants to hit their head on the faucet when they're soaking, or try to find a place for their feet if they turn the other way? The stunning cottage garden is awash with pink old fashioned roses, honeysuckle and clematis. 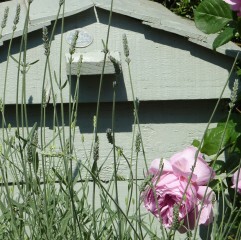 And it wouldn't be Lavender Cottage without lavender planted in the garden. I'm so taken with this precious cottage. Even though she didn't ask me to, I must give a plug for Helen Charlton and her amazing talents. 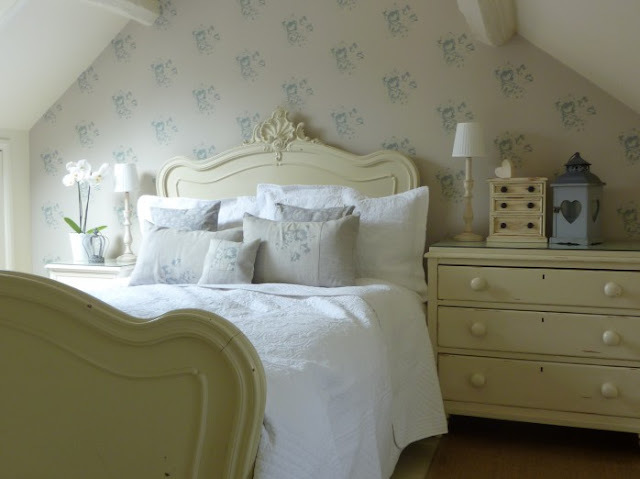 She is owner of Busy Bee Studio, has taken part in BBC2 TV The Great Interior Design Challenge, and her farmhouse and Lavender Cottage have been featured in some of England's most popular magazines. She's an extraordinary woman and I'm so pleased that I was given the opportunity to introduce you to her and the lovely Lavender Cottage. 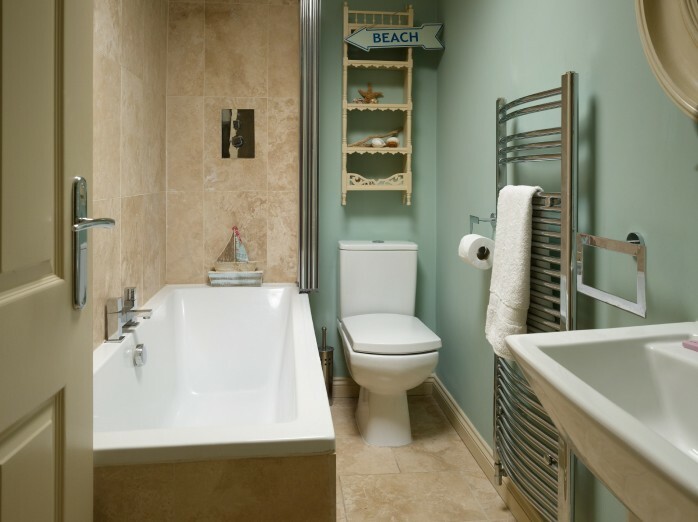 http://lavendercottagewhitby.co.uk/ If you go there, be sure to spend some time looking at the panormaic virtual tours of the cottage rooms. You'll see so much more than I can show here. Also, check out Helen's blog here and her beautiful Busy Bee Studio here. And now I have a surprise for all my faithful readers. (You didn't think we were done partying did you?) A Joyful Cottage wouldn't exist without you, nor would 100 posts on Living Large In Small Spaces be possible. So, to show my appreciation for your loyalty I'm giving away a one-year subscription (6 issues) to this magazine. "Give your home a cozy cottage look with Cottages & Bungalows. Enjoy house tours, expert tips, inspiring stories, and beautiful images that empower you to create a cottage lifestyle in any home. Organize, decorate, restore and maintain!" Six issues of inspiration can be yours. Just leave me a comment that you'd like to be entered in the drawing. If you're not a blogger or you're a no-reply blogger you'll have to leave your email address so I can reach you if you're the winner. That's it. No following rules or Facebook likes required. I'm putting you on the honor system that you're already a follower and regular reader of A Joyful Cottage because you see value in the content presented here. I'll announce the Cottage and Bungalow Subscription winner right here next Saturday, April 29. Gosh, what a lovely place! I rarely comment, but do so enjoy your posts. I live in a small home, so small house living tips are always enjoyed and appreciated. I'd love to enter your giveaway. Thank you. Congratulations on "100" LIVING LARGE IN SMALL SPACES. Lavender Cottage is quite charming. That sweet little kitchen warmed my heart. I love the bedroom under the eaves. ♥ Perfect ♥ So cosy and peaceful. The outside is so, so pretty as well. Oh yes, and I would love to be entered in your drawing. I hope that you have a blessed weekend in your precious little cottage. P.S. I have loved each and every little cottage that you have shared. Thank you so very much. Congrats Nancy on your 100th! I am charmed by Lavender Cottage and I love your home too. I'm so glad I found your blog. I look forward to reading your posts. Happy Spring and thank you for the chance to win the magazine subscription. Good luck, Betty. And thanks for the nice compliments! Congratulations on your 100th cottage. Not sure if I've visited EVERY one, but certainly most! Gorgeous, gorgeous and gorgeous! Of course I want to enter for the lovely magazine, as someday I want to live in a cottage! I follow you and will to the end!! What an amazing cottage! I love it! I've been reading here and commenting for about a month. I have you on my blog list blog where I keep a running list of blogs I regularly follow and read! I'd love to receive this magazine! I know you're a reader, Deanna, and that you leave comments. I can't respond to you directly because you're a no-reply commenter. I do leave replies on your comments at my site, though. I appreciate those comments, and I'll enter you in the drawing. Good luck! Love this sweet cottage. Love the counter tops in the kitchen. Just as sweet as can be. This is a great giveaway. This magazine would be so great to see lots of inspiration for our new cottage. Thanks for a chance. Happy Week End Nancy. 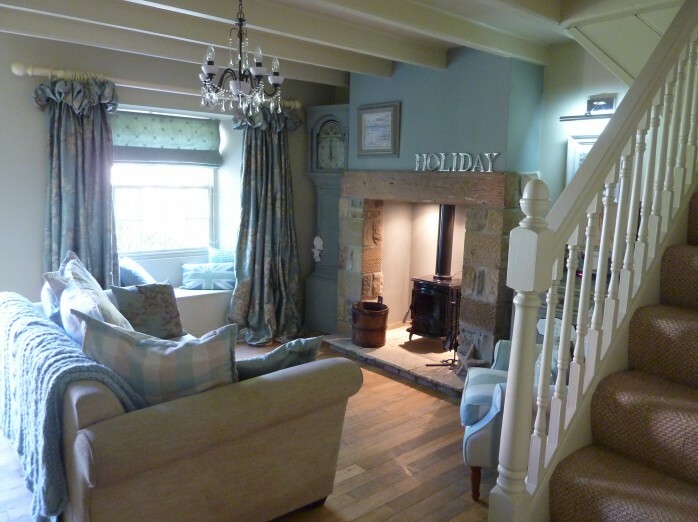 oh I love love this cottage! I would love to enter the contest. ladymiller@windstream.net. I have enjoyed reading your wonderful posts on all the delightful cottages. Thanks for joining me in the fun, Mary Ann. Good luck in the giveaway! The blue bedroom is exquisite, especially the bed. I also love the outside walls, gate, door, and gardens. Nancy, you have been so amazing sharing many small homes and cottages (including your own lovely home) with us for such a long, long time. I know how much time and energy it takes. You have always shared beautiful photos and lovely stories about these special gems. Yorkshire is far north from my original home in southwest England, and a county I've probably only visited once, but it is a beautiful area. This cottage is adorable - I would love to spend a week there - especially when the lavender is blooming! Please add my name to your very generous drawing. Not familiar with this publication but it looks really interesting. . . . . . and you know how my own small cottage home always needs help updating, renovating, or just adding something pretty! 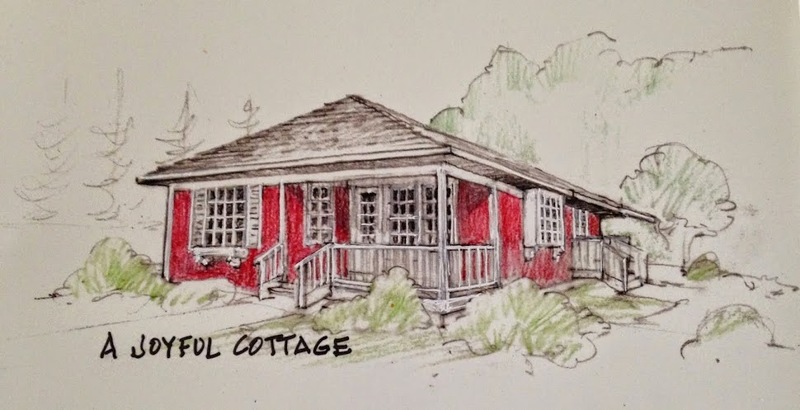 Oh I love to look through Cottages & Bungalows and would love to be entered in your drawing. Tcfjanohio@sbcglobal.net I don't have a blog, but enjoy yours tremendously. Thanks so much for reading my blog. I'm glad you enjoy it. Good luck in the giveaway. I want to enter your contest. Small cottages are what my dream home would look like even if I was to win the lottery. I just moved to a small 600 sq ft one bedroom apartment, and I am decorating it in a somewhat vintage country style. So your blog is constantly an inspiration to me. This one is truly special. This cottage was a great way to celebrate 100 posts, Nancy. I think we share much of the same taste in small homes as evidenced by Lavender Cottage. I'm swooning over the kitchen with all of the natural elements and my dream sink. 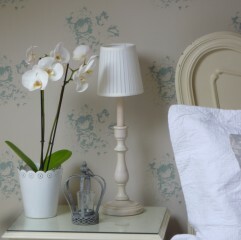 The bedroom is lovely, I'm a longtime fan of Cabbages and Roses. Wonderful giveaway...I love this magazine. Very inspirational, so toss my name in the hat! Happy 100th anniversary on your L L I S S series! Wishing you to make it a thousand and more! I was wondering what would it be. It had to be something really special. And you did it. This is heavenly bliss, the perfect escape for me. Would love to spend the rest of my life there. The giveaway is also perfect and matching. I don't know if I can enter the drawing as I'm not a U.S.A citizen. Good Morning Nancy, how wonderful that you were able to celebrate your 100th post by sharing your favourite English cottage. Added to that the cottage of your dreams. Yorkshire is the next county to where I live and it can be rugged and wild in the winter and in contrast absolutely beautiful in the summer. Our houses in England tend to be smaller than the houses in America and I have lived in both large and small. I find our smaller house to be trickier to decorate because it is so easy to overload a room with much loved personal possessions, so I always need to be aware and edit my rooms when I start getting carried away. I love the tranqulity of Lavendar Cottage and the front garden looks beautiful. 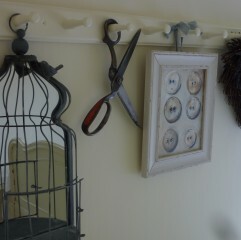 I would love to be entered for your competition as I would be fascinated to see how people decorate their small homes. Hi Daphne. You're right about the trickiness of decorating a smaller home. I'm try to create a charming little cottage that doesn't look cluttered. Not always easy to do. Good luck in the drawing. 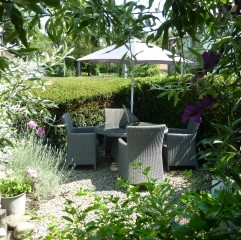 How absoluty delightful home and garden, dearest Nancy, thanks most sincerely for sharing ! Oh, I forgot to send you my best wishes for this goal of yours, Deary, forgive me, and thank you for the Gieveaway too, I hope to be able and participate, given I'm from Italy ! Now that, that is a true English cottage and like you, I am SMITTEN! The colors, the sea blue green and that bedroom......LOVE!!!! 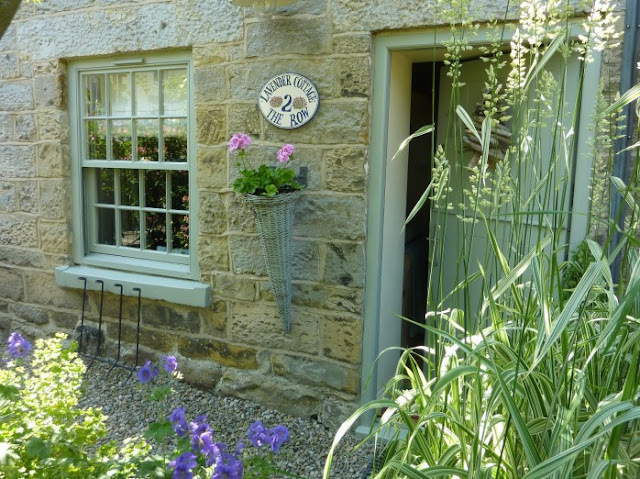 What a delightful cottage and so wonderful for your 100th post. It is so peaceful. I would love to be entered into your drawing for this magazine give away. So much inspiration there. Glad you like it. Good luck! What a charming cottage! It reminds me of one we stayed at in Stow on the Wold 2 years ago. English cottages are so charming!! Congratulations on your 100th post of your Small Spaces series, Nancy! I appreciate all the time and effort that go into bringing these home tours to us via your blog. Lavender Cottage is delightful and I thank you for sharing it with us today. I love the stone exterior and the charming details inside, too. I'd love to be entered into the drawing! Have a wonderful week! So very charming . . . The stone, the outdoor setting . 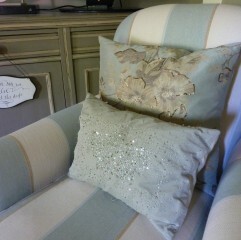 . . the softness in color adds to the cottagy charm! 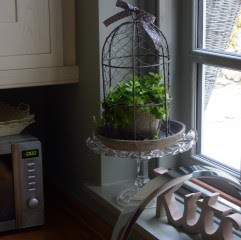 Loved the deep well window with the gorgeous drapery . . . wonder why that caught my eye. 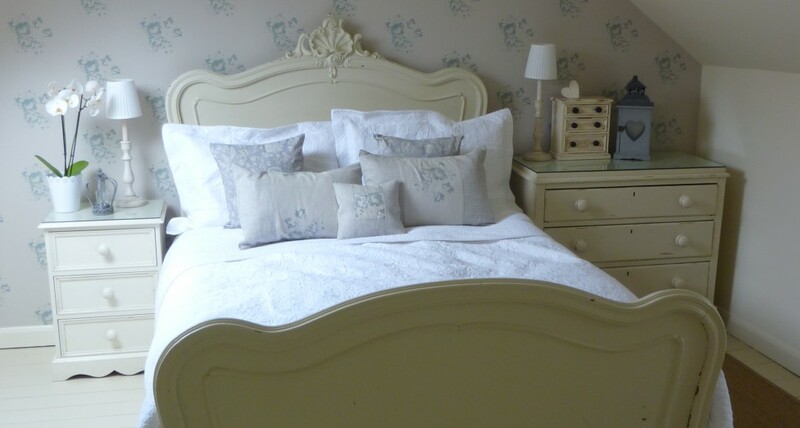 Best ever is this Lavender Cottage and perfect for your 100th posting! I would love to be entered into your drawing . . .
Hi...i must agree..this is by far the best choice for #100..it speaks to me as well..and i think this is the first time i've ever seen the firebox with a light..does yours have light inside too?..a couple weeks ago i actually started looking at your posts for LLISS..started with #1..sent a link to a friend..they're planning to downsize too..talking about maybe a condo..which i myself would not be interested in..but the one you featured..maybe within the first 10 posts or so..was so nice i had to show her.. ..Thanks for all the time an effort you put into this post..it's always a joy to see where you take me..Have a pleasant Sunday.! Hi Wende. No, our firebox doesn't have a light. I did notice that Lavender Cottage does have one, and I like it. Don't think I've ever seen that before. Have a great new week! I would love to get the subscription, "Cottage" Congrats on the #100! Thanks, Linda. It's a joy to share A Joyful Cottage with you. Good luck in the drawing. 100! It's hard to believe, but since time flies, it must be true. I have enjoyed every single one of your cottage shares, Nancy, and am truly honored that you featured my own cottage in the series too. It's easy to see why this one ranks at the top of your list. It is absolutely fabulous, even if it is predominately blue! ;) Looking forward to many more in your series and of course, I would love to be entered. Drooling over cottages? I can't think of a more pleasant pastime! Enjoy your week my friend. Cottage hugs to you! I'm so happy you like my blog, Nancy. Thank you, and good luck in the drawing. Thanks a bunch, Susan. I'm happy you enjoy the series. Good luck in the giveaway. This one is a winner . . . I love almost everything about it. The kitchen with that big window and the way the stove was set into the wall. Oh, and that great sink. The bedroom was absolutely gorgeous. How could you not have sweet dreams in a bedroom like that? I said that it was almost perfect . . . can you guess the questionable item? The square toilet . . . I have a round bottom . . . not sure that it would fit well, LOL. Nancy, your posts are always so lovely . . . I get excited when I see that you have published another one. I really missed you when you took that break. Have a great week, sweet friend. Me again . . . sorry I got so wrapped up in your cottage that I forgot to say, Congratulations! Please enter my name in you fab drawing. How can it be 100th posts in this series, where does the time fly to? I can't remember exactly when I began following you, but it has been a couple of years or more. I truly know what you mean about this gorgeous cottage, it is amazing in every way... and faucets in the center of the tub, yes! That is a brilliant idea! I loved the backyard with all the gorgeous blooms, what a lovely place they have created. I so love your blog, and find great inspirations. Can you please tell me how to purchase a year's subscription to this fantastic magazine myself. Thanks. OK. I just misread the magazine title, and know where I can do this. Thanks anyway. Glad you found it, Ellie. Thanks for reading my blog. Thank you for such a wonderful post about our Lovely Lavender Cottage! Lavender cottage is beautiful!! Love that bedroom! I like "Cottage" magazine and buy an issue here and there at our grocery store! Hope your corner of the world is warmer than us here in ND Nancy! It's almost noon and only 38 degrees. Sending hugs! 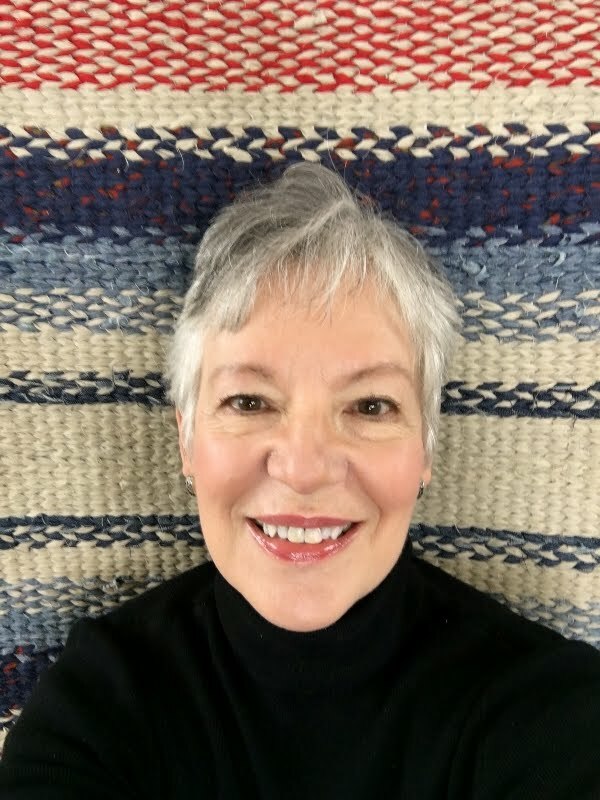 Hi Nancy, I just love this series and congrats on your 100th post!It surely does show that we all can live with a little less in our lives and I have found that it is so liberating. This cottage and gardens are just what I think a lovely home looks like. It has given me some inspiration on doing a little more to my 800 sq. ft. cottage. thank you for time and work on the series it is a labor of love. First time I have posted. I love cottages too and enjoyed the one you posted about today. Cottage is warm and inviting but so fresh and serene. Would love to enter my name for the magazine. I love that one. Thanks for reading my blog, Connie. I hope you'll continue to comment. I love to hear from my readers. Good luck with the giveaway. I have enjoyed the series. I love to look at the little details of the cottages. This one is full of the little details. I love the scissors hanging on the peg, ready to cut fresh cut flowers. Yes, I would love to have the opportunity to win the subscription. Simply lovely! Thank you and please enter me in the drawing. You're in. Thanks for joining us. As you know, I love this cottage, it's been an inspiration for me and seeing pictures of it here was really delightful! Please don't enter my name for the giveaway - I think it's very thoughtful of you to have a gift for your readers, but as I'm over see, I bet it would be difficult. Congratulations, Nancy! Well done! I do enjoy glimpses into small cottages that you feature and this week's is certainly worthy of being your 100th. I can see why you love it and it looks so familiar that I'm sure I've seen in because my splurge is treating myself to UK shelter magazines when the budget allows. 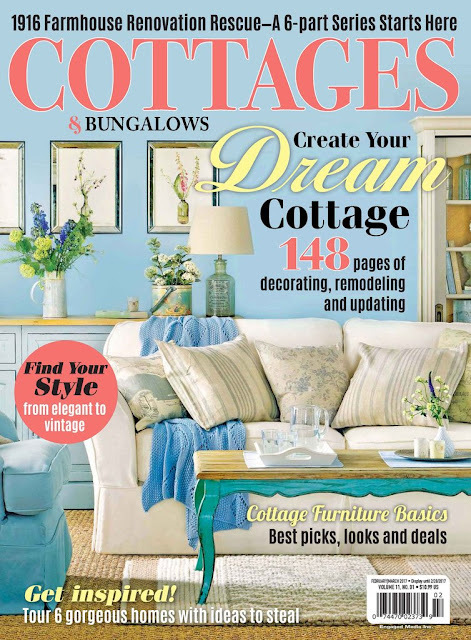 I already am a subscriber to Cottages & Bungalows--my only US decor magazine I receive--so I'll opt out of the drawing where someone else can discover this excellent magazine. The current month's issue is dreamy! I was waiting to see what cottage would be your 100th and you didn't disappoint, my friend. It's absolutely precious. I guess it's time for me to subscribe, huh? Lavender Cottage is absolutely my favorite so far! I love the colors and the mix of modern and rustic! Congrats on one hundred posts about living large in small places. Oh, I missed the give-away! What a sweet thing to give. I'll be back to study the photos of this cottage again - it's darling and filled with so many ideas!